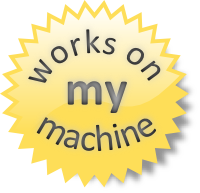 Joseph Cooney has finally codified the rigorous certification program all us software engineers have been using for a long time: It Works on My Machine. LOL. Jeff Atwood has designed some alternate badges.